It's been cool watching this campaign mature with time, because it's a real study in how T-Mobile has snapped up cultural passions and tried to leverage them in real-life while scaling the experience as much as possible. These deeply personal offline moments, sometimes hit-or-miss but often poignant, are also making great online video fodder. 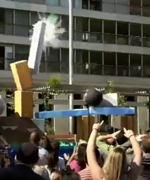 "Angry birds will now be used in real life as America's first﻿ line of defense in war." That's probably not far off the mark.